Powerful burners each deliver 60,000 Btu/hr specifically designed for Chinese cooking. Superb Twin Bar Burner rated at 30,000 Btu/hr to facilitate simmering. Both burner types have a 50% turn down provision for added controllability. All burners are fitted with individual flame failure for safety. A spray bar provides a constant flow of water over the hob, to keep the surface cool and clean. Easy to clean front gully and drain system clears cooking debris. Seamless, high grade stainless steel single pressed hob. Manufactured to conform to the most stringent hygiene and safety regulations as well as CE legislation. Supplied with utensil and wok trivet. Pull-out drip trays retain spillage. 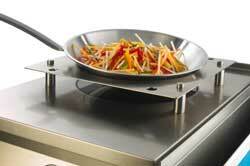 Induction Wok - the ideal bench top or front of house Wok unit. 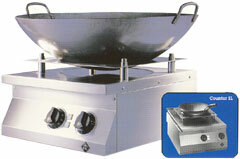 This unit combines the advantage of healthy stewing in the Wok with the economic induction technology. 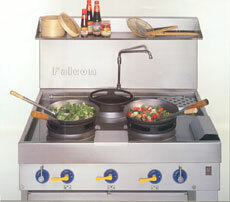 Cooking in front of the guests will become a complete success due to the safe, comfort of the induction Wok. Available with 280 and 500mm tops or without support top - more flexibility isn't possible!